Emily Morgan and Karen Ansberry have done it again! 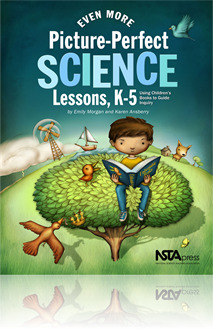 Their newest volume, Even More Picture-Perfect Science Lessons, K-5: Using Children’s Books to Guide Inquiry, is as excellent as their previous books. …This volume will be a great addition to any elementary classroom where the students and teacher will enjoy scientific inquiry and quality children’s books, and important learning will take place. Guided inquiries follow the 5E Model—Engage, Explore, Explain, Elaborate, and Evaluate. The book was written by teachers for teachers. Sixteen teachers contributed activities and ideas. That is evident as you flip through the lessons; they've thought of everything. Lessons are complete, even down to the higher order questions that will help students to think critically. ... This book will help teachers to fulfill that requirement in the science classroom without having to gather resources from several places. As a science teacher myself, I've already picked out several lessons that will compliment my existing plans. This set includes Even More Picture-Perfect Science Lessons and the Even More Picture-Perfect Book Collection. This set equips the teacher with the lesson book plus the trade books that are used in the individual lessons. Please note that while we strive to build complete collections, occasionally we can not find ample supply of one or more of the trade books. In such cases, we will ship the nearly complete collection to you, minus the missing book(s). If your collection is missing a book, rest assured that we are doing our best to find more stock of that book and will send it to you as soon as we can. If it proves impossible to stock the book in a reasonable amount of time, we will refund a portion of your payment. If you have any questions about the book collection, please email us at pubsales@nsta.org. •	Do You Know Which Ones Will Grow? •	What Will the Weather Be? •	Why Did My Ice Pop Melt? •	Wind Energy: Blown Away!